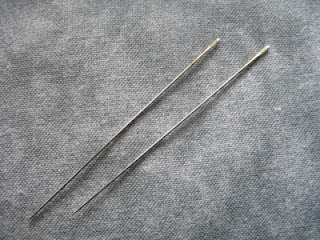 I promised I'd get back to you about the newer Japanese beading needles after I had time to give them a work out. Well, I am very pleased indeed. The company name is Tulip - easy to remember - and they are located in Japan. They are well known and respected already for their fine quality quilting needles and in December of 2010 they sent their first batch of beading needles to a US distributor to see how they would be received. They went over extremely well and now they are available through many shops in North America. From my initial experience with them, I have to say I am delighted with the quality and wearability of these needles. 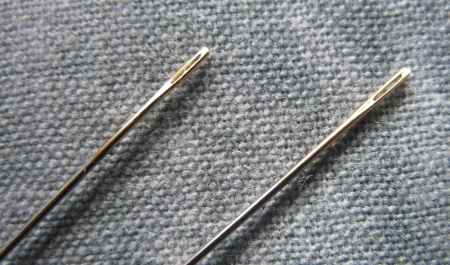 On average,I am in the habit of using # 10's for my bead embroidery on fabric so that is the needle I am reviewing here. However, Tulips are also available in 11 and 13's for those who wish finer needles for smaller delicate beads and for jewellery makers etc. 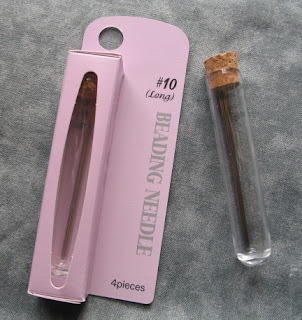 They come beautifully packaged in a pink cardboard box with a window and when opened, the needles are housed in a very strong plastic tube with a solid cork closure. The moment you set eyes on the needles, even before they are out of the box, you can't help but notice their excellent quality. The eyes are gold plated and easy to thread. An absolute charm. You can see from the photo below what quality the eyes are. Clean and clear with no snags when threading and you don't have to get out a microscope to see the holes. The eyes slip through fabric easily too with very little separation to fibres. They are durable and do not bend or break like standard beading needles. They are flexible and springy and the tip is rounded ever so slightly to slide easily into beads while preventing thread splits. The beading experience is very smooth and I believe there is less hand fatigue using them, which is especially welcome for me and something I think many beaders will appreciate! After repeated use, the needles remain quite straight and bounce right back after major bending through lines of beads and layers of fabric. I have heard from other beaders who have used them for extended periods that their longevity is superb. They proved their superiority to me when I couched down beads over a thick cord through two fused layers of cotton fabric and a layer of batting. There was plenty of stability within the needle, slight flex but no horrible bending or distortion and I did not have to force my hand to push it through. Also there was no sticky build up on the needle from the fusing. The average price is around $5.00 US for four needles, which is great value when you consider the quality and longevity of them. I was suitably impressed and although my experience with them is limited , I would definitely give them a thumbs up and A-1 grading. I know they will be my needle of choice in the future. Tulip also carries tapestry needles, crochet hooks and needle felting tools. I think their products are well worth looking into.